The Scorpio traditional direct-vent combines beauty, efficiency and performance. A clean faced heat-circulating design with the following standard features: combination top/rear flue, captivating flame appearance, glowing embers, interior lighting, ceramic glass, full function remote and variable speed blower. The standard electronic IPI ignition system features seamless battery back-up and can be operated in a continuous pilot mode. • A newly designed pan burner produces brilliant flames for a vibrant presentation and hours of enjoyment. • Ceramic glass for superior clarity. • Clean, radiant design blend with any style of mantel or trim. • Standard interior lights for great fire box illumination. • Heat-circulating design increases warm air distribution for exceptional heat. • Standard built-in blower kit enables higher efficiency and heat delivery to the living space. • Ceramic glass provides more radiant heat than standard tempered glass. • Multi-function remote simplifies operation. • Energy saving intermittent electronic pilot ignition system reduces gas usage. 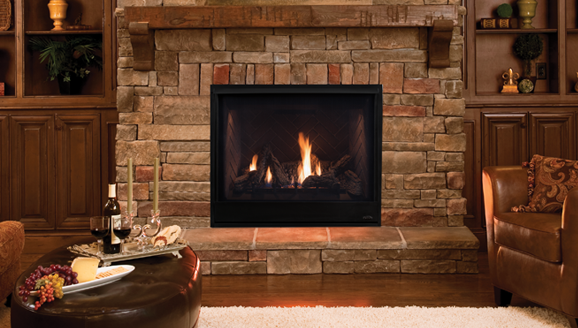 • Standard high/low flame control allows you to control the ambiance in the room. • Uninterrupted operation even during a power outage. • Combo (top/rear) venting for maximum installation flexibility. • Approved for use in any room including bedrooms.